Create your own digital signature. 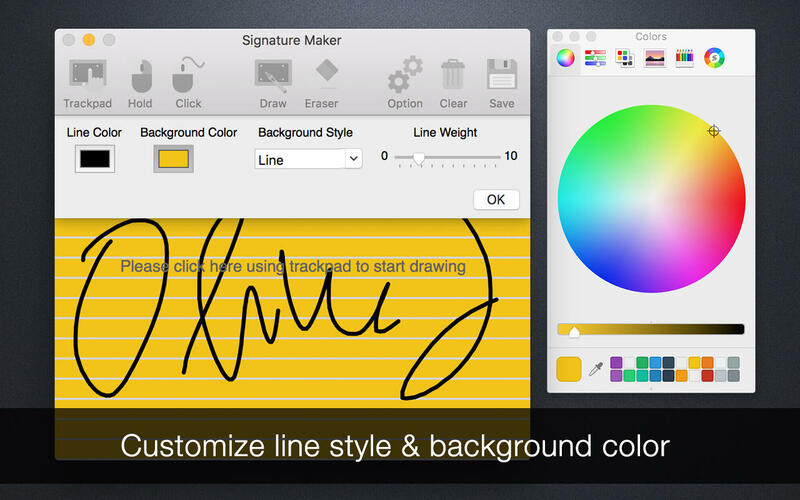 Creating your signature images with Signature Maker is as simple as drawing and sketching on a piece of paper. Just use your finger or a stylus, sign your name using the built-in multitouch trackpad, mouse, or Magic Trackpad. You can easily get your digital signature in PNG image file with transparent background. Whenever you got a digital document that requires your signature, you don't bother printing, filling, scanning or faxing. Just insert your signature image, save you lots of hassles. Simply draw your signature using trackpad or mouse, then save it as PNG file with transparent background, or copy to clipboard directly, so you can easily insert or paste your signature into other applications. - If you want to use it in Word, click 'File' -> 'Insert' -> 'Picture' -> 'Picture from File' to select your signature image. - If you want to insert signature in PDF, you'll need a PDF editor, or use our app 'Sign PDF', which is available on the Mac App Store. 3. UI improvement, support retina display now.